When Hurricane Maria devastated Puerto Rico in September 2017, the island lacked the financial resources to make a fast recovery on its own. NPR and the PBS series Frontline spent seven months looking into Puerto Rico's difficult recovery from Hurricane Maria. And beneath the storm damage we found the damage from those economic forces, triggered by a government desperate for cash and banks and investment houses on Wall Street that made millions off that desperation. Some of those banks found ways to make even more money that risked the financial future of not only the island but thousands of residents as well. "There are elements that have not been replaced in years," said José Sánchez, then the head of power grid restoration for the U.S. Army Corps of Engineers. "Puerto Rico is in dire need, not only of power plants but a reconstruction of the grid itself." And it wasn't just the power grid. Water pumping stations, bridges, levees, roads — all had been starved for investment for years. Even people's homes weren't as strong as they should have been. Before the storm, the island could afford only five building code inspectors, for a population of 3.5 million people. Banks involved in Puerto Rican finances declined NPR and Frontline's requests for an interview but said in statements that they have done nothing but try to help Puerto Rico when it was in need of money. "We've gone through not only Maria, but we've gone through the financial crisis," said top Puerto Rican banker Carlos Capacete. "It doesn't end. And there's no help coming. In the financial crisis, [Puerto Ricans] are the ones left holding the bag here. There was no life raft in the plane." It wasn't always this dire. For decades, Puerto Rico's economy was booming. A special tax break on the island lured in pharmaceutical companies and manufacturers. "When you start borrowing long term just to pay next month's payroll you know you are going down the rabbit hole," said Sergio Marxuach, the policy director for the nonprofit Center for a New Economy in Puerto Rico. "It was crazy," he said. "The government was borrowing at an incredible clip." Like most governments, Puerto Rico preferred to borrow money through the sale of bonds. The island would take an investor's money and essentially give him an IOU — a promise to pay the money back with interest. Investors liked the deal because they could earn that interest tax-free. Banks liked the deal too. They stepped in to structure the bonds and find buyers — often pension funds, retirement accounts, maybe the bank's own investment clients — all in exchange for fees. "Fund managers, they will not admit this now, but when Puerto Rico was selling debt like pancakes, they loved Puerto Rico debt," Marxuach said. "You would put ... these Puerto Rico bonds into your portfolio and since they had slightly higher interest rates and no taxes attached to them, you immediately looked like a genius. You just bumped up the entire return." "So that's your bonus," he added. "That's your new Mercedes, your new yacht." "All the major banks in New York would come to Puerto Rico on a regular basis to pitch deals," said Capacete, a former branch manager for UBS, the largest broker-dealer in Puerto Rico. "They make commissions. They make fees. This is kind of like a moneymaking machine. As long as there are transactions coming and going, they're making a ton of money." But Capacete said that in 2011, he and other bankers started realizing what many bond investors hadn't yet figured out: Puerto Rico was in trouble. There was too much debt. And instead of moving away from bonds — and keeping the shaky investments out of their clients' portfolios — Capacete says the opposite happened. He said banks pushed brokers to sell more bonds. Many of the bonds were specifically designed to be sold to Puerto Ricans, packaged into special funds that were less transparent than anything regulators would allow on the mainland. Regulations against things such as banks recommending their own bond deals to investors didn't apply on the island. 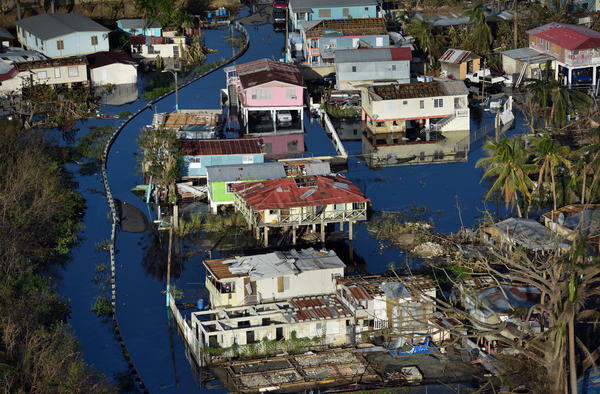 According to court records filed in the aftermath of the island's economic calamity, brokers sold thousands of Puerto Ricans these special funds. This left hundreds of millions of dollars of the island's wealth concentrated in increasingly tenuous investments — at the worst possible time. "It's unethical, it's against the banks' regulations and it puts the client in a really, really tough risk situation," Capacete said. UBS declined NPR and Frontline's request for an interview but said the loan terms were fully disclosed to clients and that Capacete is a disgruntled former employee who has sued the bank. The bank said the loan program as a whole did not violate financial regulations, but that it had fired the one broker it discovered had been using the program incorrectly. And it pointed to a separate case where federal regulators determined the bank had not misled its customers. Looking back, Rosselló said at this point in the financial crisis it seemed like "the government of Puerto Rico was run as a big Ponzi scheme." "What you had was essentially a black box of a government running, that had no clarity as to what was being borrowed and or what was being spent," Rosselló said in an interview with NPR and Frontline. Almost $900 million raised from the bond issue didn't go to Puerto Ricans — or even to keep the government afloat — but instead went to pay back loans, pay fees or eliminate risk of banks directly involved in putting the deal together. "They had much more [debt] than they wanted and they needed to unwind that," Rivera said, adding that the bond deal allowed them to do that. "The banks get out, and everybody else gets stuck with the bill," Rivera said. "Most of the general public didn't understand what was going on. The darkness of this bond deal made a lot of people in Wall Street happy, but it was immoral in many ways." Fifteen months later, Puerto Rico announced it couldn't pay its debt. The island was broke. PBS Frontline's Emma Schwartz, Kate McCormick and Rick Young contributed to this report.